This hose is slippery; therefore, it is not easily stuck or folded. The slippery hose makes it hard to be stuck. Can move or work with it smoothly. 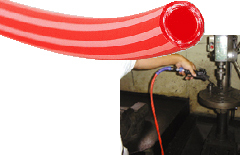 The hose is soft and pliable, which reduces the stress on wrists and arms. The hose is pliable, which prevents snapping.